HT29-Lucia™ AhR cells are engineered from the human HT-29 colon adenocarcinoma cell line for the study of the aryl hydrocarbon receptor (AhR) genomic signaling induction (see details), by monitoring the activity of the Lucia luciferase reporter protein. Therefore, HT29-Lucia™ AhR cells are highly relevant for studying intestinal microbiota-related ligands for AhR. 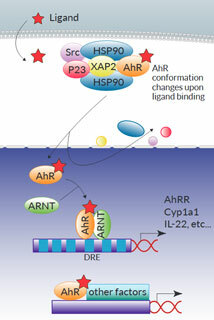 HT29-Lucia™ AhR cells express the secreted Lucia luciferase reporter gene under under the control of a minimal promoter coupled with the human Cyp1a1 gene entire regulatory sequence, which contains six dioxin responsive elements (DREs). HT29-Lucia™ AhR cells are resistant to Zeocin™. 2. Park JH. et al., 2018. Kynurenine promotes the goblet cell differentiation of HT-29 colon carcinoma cells by modulating Wnt, Notch and AhR signals. Oncol Rep. 39(4):1930-8. 3. Martínez-Maqueda D. et al. 2015. HT29 Cell Line. Bioactives on Health: in vitro and ex vivo models. Springer. Chapt 1. 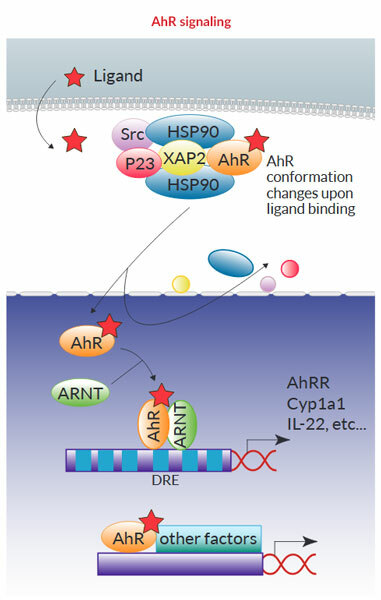 Induction of AhR activity by tryptophan byproducts in HT29-Lucia™ AhR cells. The cells were incubated with 100 μM ITE, 18 μM FICZ, or 150 μM L-Kynurenine. 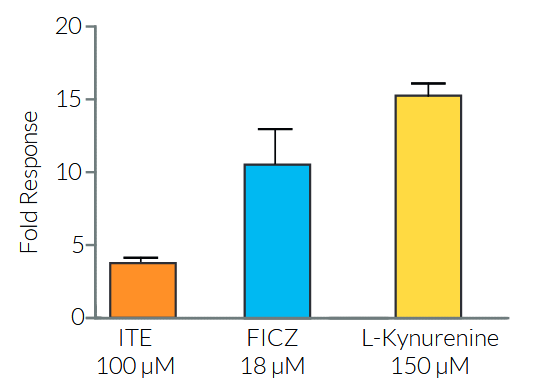 After overnight incubation, the AhR activation was assessed by determining Lucia luciferase activity in the supernatant using QUANTI-Luc™. Data are expressed as fold responses as compared to non-induced cells. HT29-Lucia™ AhR cells are guaranteed mycoplasma-free.